Does Pennsylvania have a spread pricing problem? In late-October, the Centers for Medicare and Medicaid Services (CMS) released a new round of data that shows what states across the country are being charged for prescription drugs through their Medicaid programs. This update of “State Drug Utilization Data (SDUD)” provides a treasure trove of information for those looking to understand the dynamics and complexities of the drug supply chain and the way we pay for medicines. As goes Ohio, so goes the nation? As many of our readers know, we have disproportionately focused on drug costs in the state of Ohio, due to it being home for 46brooklyn’s co-founders, and also because Ohio has become ground zero for controversy after recent audits of their Medicaid managed care program showed that pharmacy benefit managers (PBMs) had pocketed $224 million in previously-hidden pricing spreads, an overwhelming majority of which occurred through generic drugs. The fallout of the audit was significant. All PBM contracts were terminated by the Department of Medicaid, new full transparency requirements begin next year, “spread pricing” has been prohibited, the Ohio Attorney General is planning to sue, and most recently, now the managed care plans that contract with the PBMs are falling under the microscope too. Frustration with management of the program has reached such a boiling point that Ohio lawmakers are threatening to carve the entire program out of managed care. Pressure from Ohio legislators and the team at the Columbus Dispatch helped create the exigency for the state to open the books. While the Ohio story is really where everything started, we have been inundated with emails and calls from other states wondering if what we found in Ohio was happening in their states too. The short answer is: we don’t know. Every state has different degrees of oversight, varying policies, diverse plan and PBM mixes, and varying levels of managed care competition. While we believe the data that we’ve mapped out in our visualizations helps to provide hints of where trouble might lay, it is incumbent on all states to get a better handle on how their Medicaid programs are structured and where taxpayer money is going. But even though we may not know for sure which states share some level of the Ohio PBM / managed care problem, we do know that there are three general ingredients that may suggest that you could have an “Ohio problem” in your state. Ingredient #1: There is a large managed care presence in your state. This information is available, at least for 2016, thanks to MacStats from Medicaid and CHIP Payment and Access Commission (MACPAC). Kaiser Family Foundation also tracks Medicaid managed care penetration rates by eligibility groups. Ingredient #2: Your state managed care plans are in traditional non-transparent spread contracts with their PBMs. While this is more difficult to figure out, odds are that most contracts are structured this way, because the economic incentives for both the managed care organization (MCO) and the PBM favor this type of a contract. Another indication that a spread contract is in place is that you will see strange looking markups on any of 46brooklyn’s three markup dashboards, indicating that the state is reporting a price paid for a given drug that appears to be disconnected from its true acquisition cost. Ingredient #3: Pharmacies are complaining about reimbursements – and we don’t mean the anonymous-Twitter-handle-lamenting-a-ten-dollar-loss-on-lisinopril type of complaining; we mean the “we are going out of business now” type of complaining. The type of complaining that we are currently seeing in states like Kentucky, New York, Illinois, and Pennsylvania. Pennsylvania is unique among this group, only because they have a fourth ingredient, and that is a very vocal and engaged State Auditor (Eugene DePasquale) who is pushing for more data but lacking the statutory authority to fully audit the program and report complete details to the public (a state auditor who can’t audit a state program: red flag). Over the last few weeks, it appears that there is some building momentum for transparency on where Pennsylvania Medicaid prescription drug dollars are going. The Philadelphia Inquirer’s Catherine Dunn has covered some of the recent developments here, here, and here. As such, to assist Mr. DePasquale perform this necessary work to ensure that the third largest managed care prescription program in the country has proper transparency and accountability around drug pricing, we decided to zero in on the Commonwealth’s Medicaid data to see if the markup variations that we have been seeing in Ohio are in any way similar. Before digging into the data, it is important to note the dynamics at play in Pennsylvania relative to other states. Pennsylvania is predominantly a managed care state, with 77.8% of all eligible patients enrolled in Medicaid Managed Care, according to the most recent data from MacStats. There are nine managed care organizations (MCOs), each with their own structure for pharmacy benefits. You can see the market share for each plan as of September 2018 in this breakdown from the Pennsylvania Department of Human Services (slide 8). Kaiser Family Foundation has a very handy Medicaid Managed Care Market Tracker that helps track managed care enrollment, spending, quality ratings, and much more. We’ve embedded their map of MCOs per state below (Figure 1). Overall, applicable Medicaid programs average seven managed care plans per state. Ohio has five, and Pennsylvania has nine. But when it comes to prescription drugs, it’s not as simple as focusing on the plans. MCOs typically outsource their drug programs to PBMs to administer the benefits. In Ohio, despite having five MCOs, there are only two PBMs: four MCOs (Caresource, Buckeye, Molina, Paramount) contract with CVS/Caremark, and the other MCO (United Healthcare) owns their own PBM, OptumRx. While it would be much more helpful to get a PBM Medicaid market share breakdown by state, we do believe it’s fair to say that a more competitive managed care and PBM landscape should yield better accountability and pricing, but again, to know for sure, it would take an audit of the program. With the launch of 46brooklyn back in August, we released an in-depth report on the pricing patterns involving the expensive leukemia drug, generic Gleevec (Imatinib Mesylate). Robert Langreth at Bloomberg also examined the phenomenon in an article in September. While much of Langreth’s piece centered on Ohio, it appears the trends in Ohio are also being seen in Pennsylvania. But while Ohio’s bad situation appeared to improve in Q2 of this year, Pennsylvania got worse. From Q1 to Q2, the amount of markup on Imatinib Mesylate 400mg Tablets that Ohio Medicaid managed care PBMs charged the state decreased from $5,482.73 per prescription to $5,201.96. This resulted in $280.77 per prescription savings from one quarter to the next. While the markups that Ohio are paying are still incredibly high, at least the trend showed sign of improvement. In Pennsylvania, Medicaid managed care PBMs charged the state a markup of $3,029.12 per prescription in Q1 and $4,376.06 per prescription in Q2. Overall, Pennsylvania’s Medicaid managed care PBMs increased the price of Imatinib Mesylate 400mg Tablets $1,346.94 per prescription in just one quarter (Figure 2)! So, while the actual price of generic Gleevec was cut in half (Q1 NADAC = 83.69 per unit; Q2 NADAC per unit = $41.70), Pennsylvania’s Medicaid PBMs increased the markup by more than 44%. Overall, on just this one strength of one drug, in just one state program, Pennsylvania taxpayers have paid nearly $1.3 million in markup in less than half a year. As we discussed back in October, because this drug is typically categorized by PBMs as a specialty drug, it is likely that this drug is predominantly dispensed at PBM-owned pharmacies, which if true, it means the entire $1.3 million markup would be captured by the PBM. This small window into one of the first major specialty oral solids to go generic begs the question if PBMs are properly incentivized to contain specialty drug costs if they own the margins in the marketplace. Staying in the oncology space, the drug that saw the second highest rate of markup increase was generic Xeloda (Capecitabine 500mg Tablet). Much like Gleevec, Xeloda is also designated by most PBMs as a specialty drug (see CVS, Express Scripts, United Healthcare), which again likely means that distribution is largely pushed to PBM-owned specialty pharmacies. 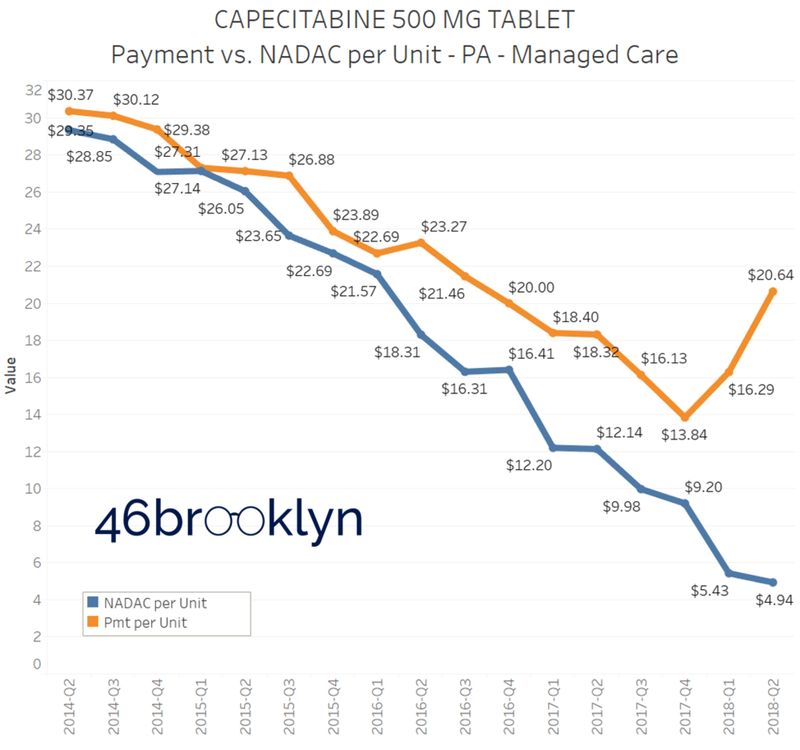 The average NADAC price of Capecitabine dropped from $5.43 per unit in Q1 2018 down to $4.94 per unit in Q2 2018. In Q1 2018, the state of Pennsylvania was charged $16.30 per unit, but in Q2, despite the actual price of the Capecitabine declining, the state was charged $20.64 per unit. In this time period, PBMs increased their markups by nearly 50%, capturing an average of $1,414.69 per prescription. In case you’re sitting there saying, “I’m not in Medicaid, this doesn’t impact me,” we’re going to pop your balloon. Your state taxpayer dollars paid for it. Your federal tax dollars are being sent to cover a matching portion of Medicaid’s dollar spend as well. And according to research in the Journal of the American Medical Association, these kind of Capecitabine pricing distortions are also being seen with commercial plans dating back to 2016. The last drug we wanted to zero in on is generic Seroquel XR (Quetiapine ER 400mg Tablet). Back in 2010, brand-name Seroquel was the sixth highest grossing prescription drug in America, and as such, utilization picked up significantly once drugmaker AstraZeneca’s patent expired in 2012. As that patent expiration approached, AstraZeneca took a bit of a beating in the media for increasing its price on Seroquel by 16.5% in 2010. But fast-forward the tape, and you see that eventually, shortly after the generic of Seroquel XR was released in 2016, the price dropped like a rock, going from a January 2017 NADAC price of $19.92 per unit all the way down to $1.23 per unit just a year later. This shows how powerful competition is within the generic marketplace when it is working properly. Here, you have the brand manufacturer getting criticized for raising the price 16.5% in one year, but then when they lose their patent, generic companies deflate the price by 93.83%, and they get no love. Well, to Accord Pharmaceuticals, AstraZeneca Pharmaceuticals, IntelliPharmaCeutics, Lupin Limited, Pharmadax, Aurobindo Pharma, Novast Laboratories, and SciGen Pharmaceuticals … we salute you. So the market did its part. What happened to the Pennsylvania taxpayers paying the bill? As Quetiapine ER 400 mg Tablet hit the market, the first full quarter of data began in Q1 2017, and at that time, the NADAC price was $18.22 per unit and Pennsylvania Medicaid was charged $20.01 per unit by its managed care PBMs. The markup was $1.79 per tablet. By the end of the year, the NADAC had dipped to $1.28 per unit, but the state was charged $7.47 per unit, bringing the markup to $6.19 per tablet. Within just one year’s time PBMs had increased the markup by nearly 250%. You won’t find any news stories on that. With the NADAC price down to $0.90 per unit by Q2 2018, the overall cost to the state remains stubbornly elevated at $6.30 per unit. In less than half a year, Pennsylvanians have been charged more than $400,000 in markup on just this one strength of one drug. These markups aren’t inherently wrong per se, but they are a major warning sign and deserve explanation, better clarity, and heavy scrutiny. Any time charge rates are this detached from an objective pricing benchmark, it means that a payer’s fiscal fate is being manipulated and determined by someone else who may not have the payer’s interests at heart. In late-October, we launched our newest visualization tool, the Top 20 over $20, which provides an interactive way to view the 20 top drugs (ranked by absolute markup dollars) that sported a markup per prescription of $20 or more for any state Medicaid managed care program in each quarter dating back to 2014. Below are Pennsylvania’s Top 20 over $20 for most of the second quarter of 2018 (Figure 6). 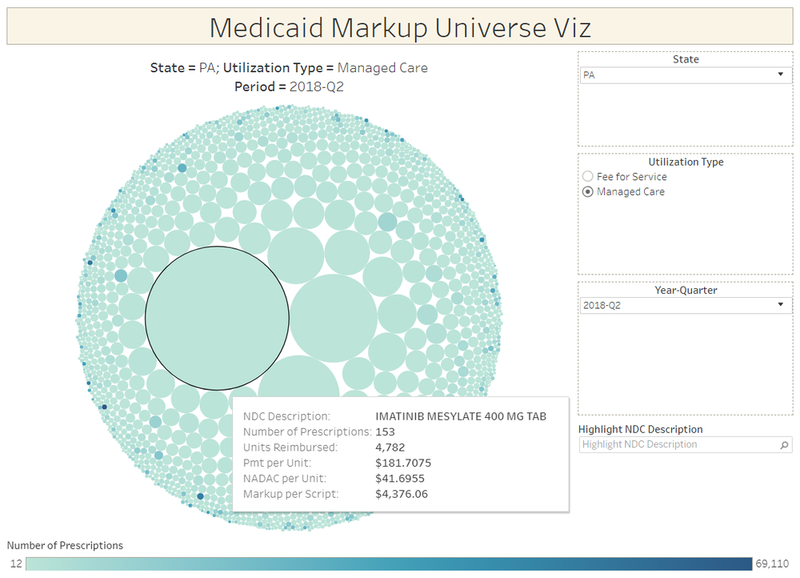 To get an even more complete picture of markups from one drug versus others, check out our Medicaid Markup Universe visualization. You’ll see below that generic Gleevec is the big bubble (Figure 7). In examining these hefty drug markups, it is clear that the rates being charged to the state bare little resemblance to the actual costs associated with those medicines. If these numbers do point to an “Ohio problem” in the state of Pennsylvania (we think they do), this should be a major concern for the administration and lawmakers. If Pennsylvania is married to the concept of paying more money to entities that yield less production, perhaps they could save some administrative costs by cutting their PBMs loose and hiring Bob Nutting instead. Regardless of whether you feel that these markups are reasonable or not, this price manipulation is a clear indicator that the rates being charged to Pennsylvania Medicaid (and taxpayers) are being subjectively invented rather than being based on an objective benchmark. This is a tremendous amount of power and control for the state to hand over to non-fiduciary middlemen with little oversight and transparency. To be clear, there is nothing inherently wrong with handing the management of your prescription benefits over to a for-profit enterprise. But at the very least, with the size and complexity of the job that is being outsourced, the program should have proper guardrails and be audited thoroughly from time to time to make sure the for-profit enterprises that are managing the program are operating in the public’s best interest. The fact that the Pennsylvania state auditor doesn’t have the statutory authority to obtain complete, open access to the details of the program that is the biggest line item in the state budget is frankly, unbelievable. We applaud Auditor DePasquale for seeking truth in this complicated industry, and we hope that this data and discussion will provide the exigency needed to get him all the information he needs to do his job.